Clean the asparagus and cut the end of the stem (the hardest part). Boil them in salted water for 5-6 min. Meanwhile in a large bowl, beat the eggs. Add the milk. Add salt and pepper to your taste. Drain and dry well the asparagus. Let them cool. Halve the asparagus. Keep the asparagus tips (6-7 cm) aside and chopped the remaining stems in pieces. Add the emmenthal, the asparagus stems pieces and the ricotta to the egg mixture. Roll out the puff pastry to form a disc of about 24 cm in diameter and 1-2 mm thick. Put the disc in a baking pan greased with little oil and prick the puff pastry with a fork. Pour the asparagus mixture and decorate the pie with the asparagus tips. Fold the edges of the puff pastry. Bake in preheated oven at 180 ° C (350°F) for 25-30 minutes (or until golden). 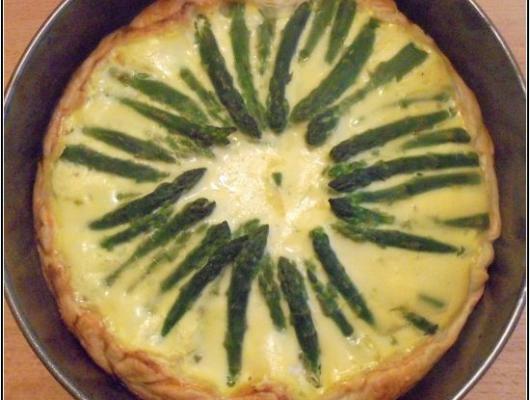 The asparagus pie is a classic recipe. 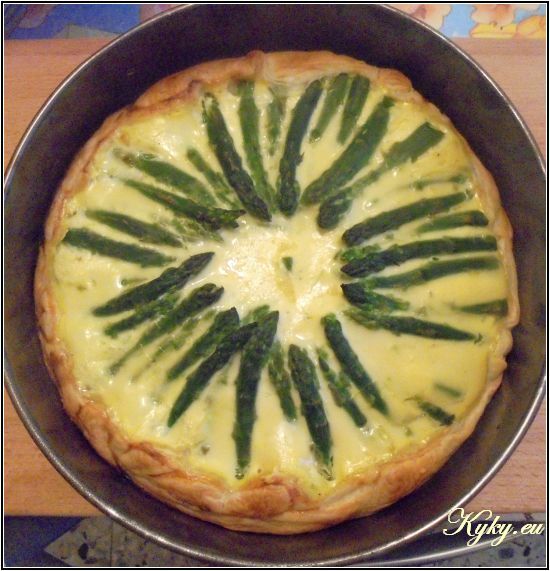 It is a simple and easy recipe and it needs only 20 minutes to be prepared, then you bake it and in less than 1 hour you have a wonderful yummy asparagus pie.